Vanilla has a wonderfully natural aroma that most find "EXTREME" (unisex)ly appealing. The aroma of vanilla eases stress, induces feelings of comfort. Vanilla has remarkable curative properties. Vanilla is known to soothe as well as promote new healthy skin growth. 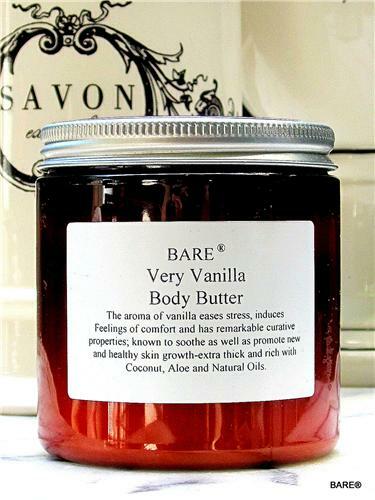 BARE Vanilla Body Butter is extra thick and rich with Coconut, Aloe and Natural Oils; a silky-smooth, paraben-free butter that quickly melts into skin to restore softness and hydration. High in glycerin, this body butter is long lasting and absorbed quickly. on 1/10/2015 Very Vanilla...it's amazing! omg, I am in love with you very vanilla body butter it's amazing. You have an amazing product, the scent it's the right amount of moisture, I'm in love and I will be a returning customer for sure. my question is do you guys have a smaller version of very vanilla?? I'm going to purchase the large container but do you have a gift set? ?